A single page website, with integrated contact form for a UK based Courier service. 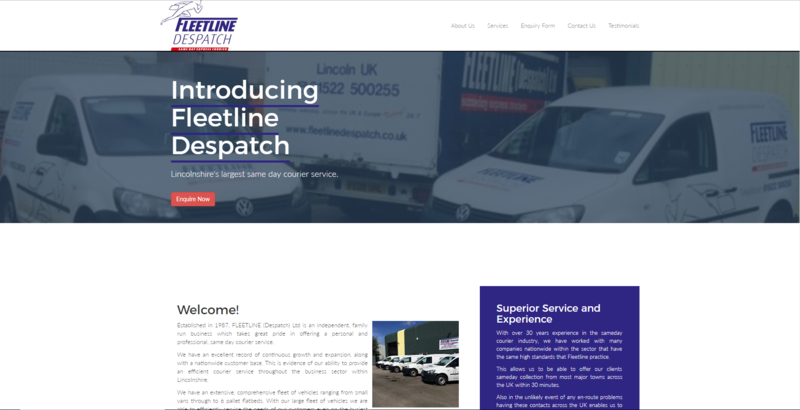 Fleetline Despatch are a courier service, based in Lincoln, that operates throughout the UK and into Europe. Bob Fenwick, the managing director, had seen some of the work provided on one of our other projects and was interested to see how BluCreative could update their current website to be more modern, with a cleaner design. Despite not expecting heavy usage of the website, Bob was still conscious that Fleetline needed some presence on the web and, as such, wanted something simple and to the point. BluCreative worked with Bob to design a website operating within a single page, which included all the necessary information for customers, and an in-depth contact form for customer requests. The website was built from the ground up, using the Bootstrap framework and some other 3rd party plugins for the contact form. Other than that, the website is all custom html and css code designed to minimise the footprint on the organisation webserver, as well as ensure that there are not a multitude of background scripts running that could impact user experience. View the Fleetline website here.